Above: List of the dozen exonerations to date by the Brooklyn DA. Brooklynites just lost their chance to have one of their own in the powerful position of NYS Assembly speaker. 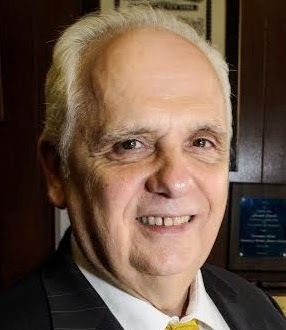 Brooklyn Assemblymember Joseph Lentol suddenly withdrew from the race on Thursday, the Brooklyn Eagle reports. 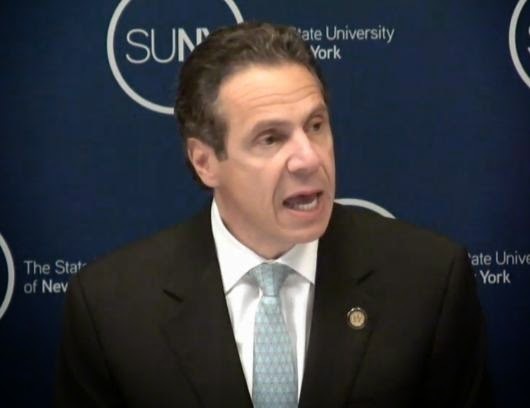 Lentol cited the need for a united front in Albany in the wake of the scandal surrounding Speaker Sheldon Silver. This gives Bronx Assemblyman Carl Heastie’s bid a boost, the Daily News says. 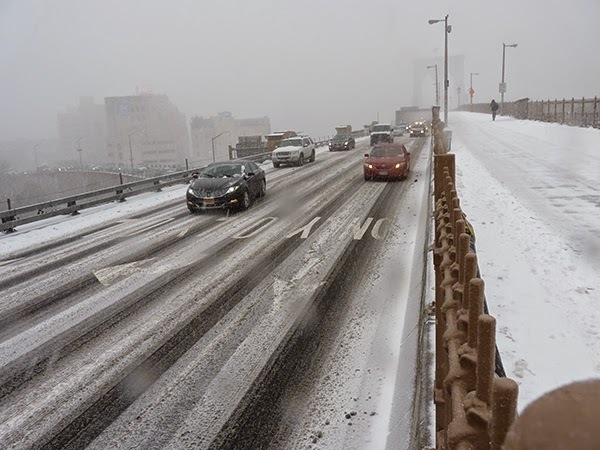 New York City's Office of Emergency Management has issued a Weather Advisory for tonight and Friday (January 30). Light snow is expected to begin tonight and continue until early Friday morning. An accumulation of 1-2 inches of snow is expected, with little to no ice formation, but roads could be slippery for Friday's commute. And from the National Weather Service: LOW PRESSURE WILL TRACK SOUTH OF LONG ISLAND SUNDAY NIGHT AND MONDAY. ALTHOUGH THE EXACT TRACK AND TIMING OF THE SYSTEM ARE STILL UNCERTAIN...THERE IS THE POTENTIAL FOR 6 INCHES OR MORE OF SNOW ACROSS THE ENTIRE TRI-STATE AREA. New Yorkers are advised to check on their neighbors, friends, and relatives - especially the elderly and those with disabilities. 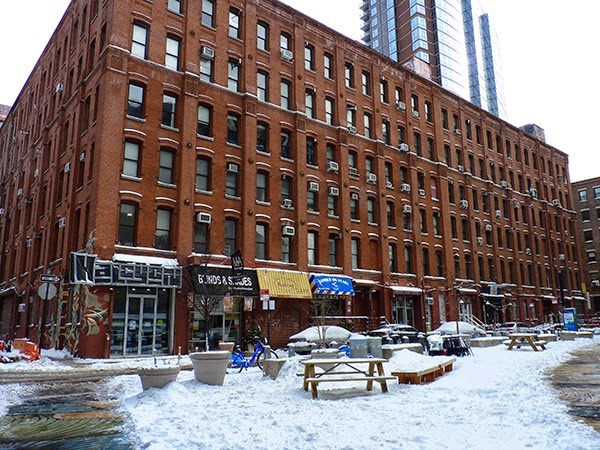 Cops were called to a Gowanus property literally hopping with rabbits after someone noticed them jumping around in the snow drifts. 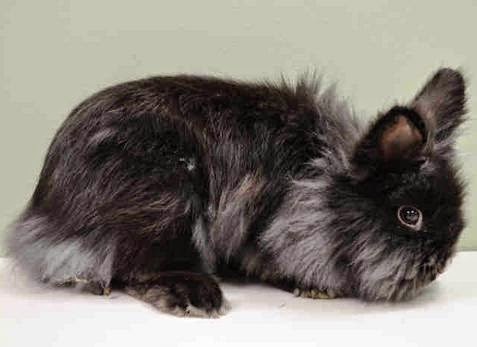 According to the Daily News, the cops seized the rabbits — all 74 of them — and brought them to the city’s Animal Care and Control office where they were being treated Tuesday. A commenter claimed the rabbits "were kept by the 'owner' in a dirty alley filed with garbage with little shelter." Another commenter supplies a link to the shelter (petharbor.com) where the rabbits were brought. Turns out there are hundreds of shelter bunnies. So if anyone needs a rabbit, check this out. 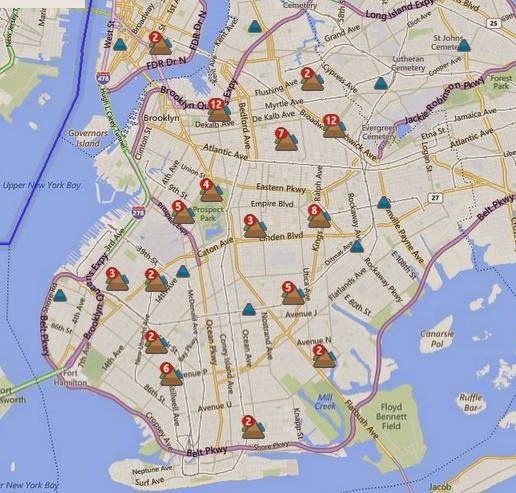 Scattered power outages across Brooklyn have lingered into Thursday. 362 locations in the borough were without power early Thursday morning, according to Con Edison's Storm Center. 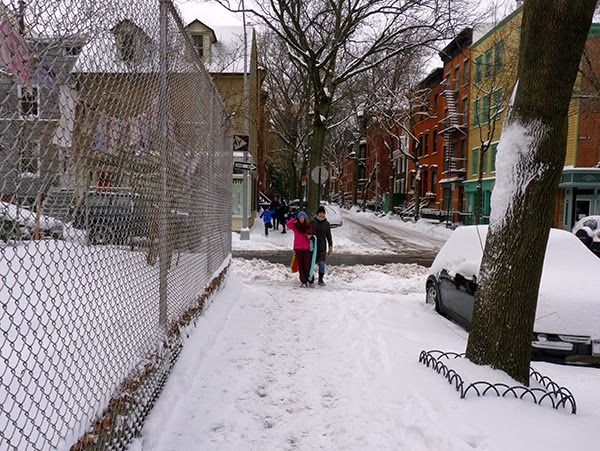 Many are related to the non-Blizzzard of 2015, which left close to a foot of snow -- and much corrosive ssalt -- on many Brooklyn streets. What a beautiful snowstorm the non-Blizzard of 2015 -- also known as winter storm Juno -- turned out to be! 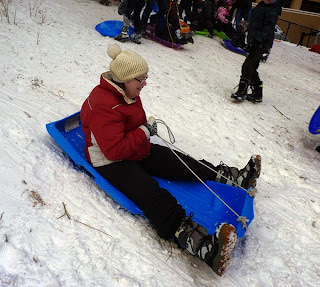 It was the perfect combination of snow, a half-day off from work and a school Snow Day. 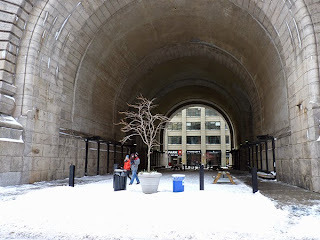 We took a walk through DUMBO and Brooklyn Heights to see the sights. Not too many pedestrians in DUMBO except for those strolling in the snow -- and no one eating at the benches in the Pearl Street Triangle. Getting to Squibb Hill to go sledding! 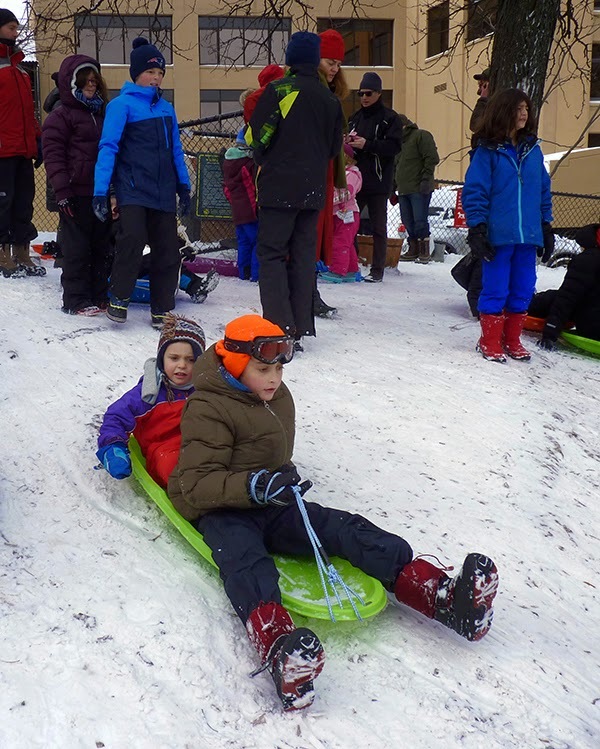 The hill was filled with families having fun on this most perfect of Snow Days. The full fury of winter storm Juno hasn't fully hit Brooklyn yet, but the wind is already driving little icy pins into the eyes of walkers braving the weather. 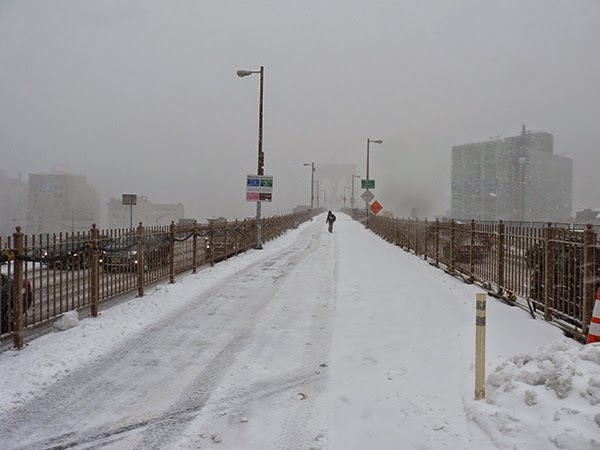 Here's a photo taken earlier today on the walkway of the Brooklyn Bridge as the storm gathered force. At a press conference on Monday, Mayor Bill de Blasio warned unnamed for-hire car services that price-gouging during emergencies was illegal. Uber told AP that "surge pricing will be capped at 2.8 times the normal fare" during the storm. That's not even triple, which is what Louie the Lip charges during emergencies. Uber is waay better than Louie the Lip! 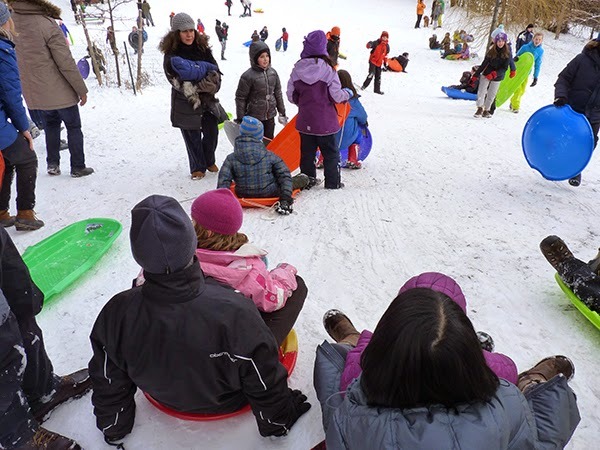 All roads and subways are closing at 11 p.m. Monday so get on home. 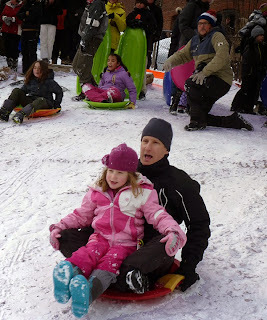 Because of the Great Blizzard of 2015, NYC Mayor Bill de Blasio and Gov. Andrew Cuomo are shutting the city and downstate NY down tonight at 11 p.m.
De Blasio issued a Winter Weather Emergency Declaration restricting travel by all except emergency personnel beginning at 11 p.m. New York City subways and buses will operate only local service beginning at 8 p.m.
Mass transit, trains and buses will be suspended and a travel ban will go into effect at 11 p.m on all local and state roads in the following 13 counties: Bronx, Dutchess, Kings, Nassau, New York, Orange, Putnam, Queens, Richmond, Rockland, Suffolk, Ulster, and Westchester. Long Island Rail Road, Metro North, Staten Island Railroad service will be suspended beginning at approximately 11 p.m. until further notice. PATH service will operate on a weekend schedule beginning at 9 p.m. and be suspended at 11 p.m. until further notice. If you haven't already, you should pop out Monday morning and buy a few supplies to prepare for the Great Blizzard of 2015. The city might just grind to a halt by Tuesday, with two feet of snow, some power lines down and outdoor subway trains, the LIRR and MetroNorth out of commisssion. 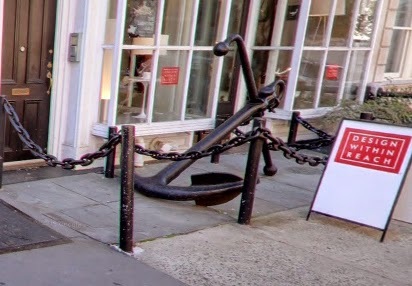 It seems that Trader Joe's and Whole Foods have already been raided by entrepid New Yorkers, but not to worry. The city has enough bodegas and grocery stores to supply what you'll need to get through the next two or three days holed up in your apartment. - Cash: Get enough for a few days' necessities, in twenties or smaller. - Basics electronics: Flashlight, transistor radio, batteries. - Food for humans and pets. It doesn't have to be fancy: soup, pasta, sandwiches, eggs or frozen meals-ready-to-eat. Fruit: apples, bananas, a bag of clementines or oranges. Carbs you can eat without cooking, like cereal (you'll need milk), bread, granola bars. 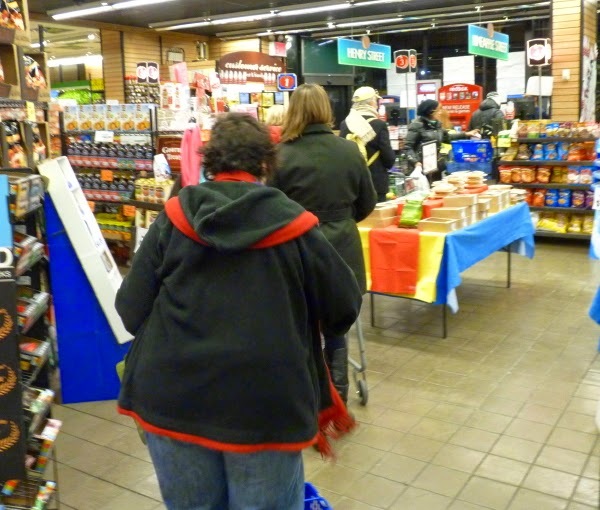 Buy treats, too: cookies, chips, beer, whatever you like. - Get some water on the off chance you lose electricity and don't feel like drinking water out of your bathtub. - Don't forget baby formula, prescriptions, tissues, sanitary needs and toilet paper! - If you are a home owner, you'll need salt and a shovel. NOTE: Gas stoves with a pilot light work even if the electricity goes out, but the newer gas stoves have an electric igniter and they won't work. You may be able to manually light them with a match, however. 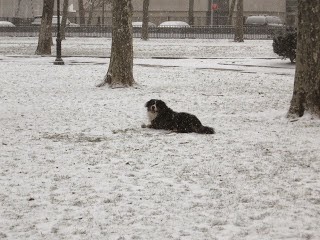 Note: Keep dogs on leash -- they get confused in the snow and may lose their way. Wipe off their paws carefully when they get back inside. 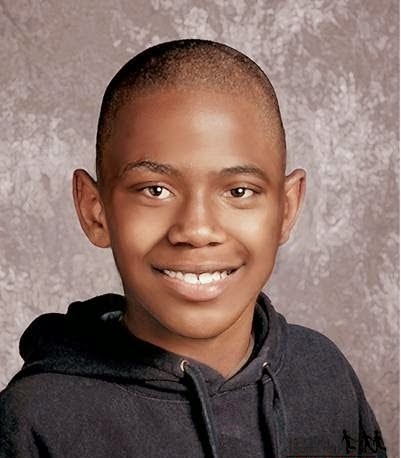 NYPD is seeking the public's assistance in locating Patrick Alford who was last seen 5 years ago on January 22, 2010 at 11pm, leaving the lobby of the "Spring Creek Development" (his residence), located at 130 Vandalia Ave, within the confines of the 75th Precinct in Brooklyn. This photo shows how he might look today. More at NYPD News. Councilman David G. Greenfield issued a condemnation of a noisy protest in the Council Chamber today by Pro-Palestine activists (shown above). Greenfield said the activists timed their protest to occur "at exactly the same time that the Council was passing a resolution commemorating the liberation of the Auschwitz death camp where 1.1 million people were slaughtered." Pro-Palestinian supporters had submitted a petition to the NYC Council demanding that the Council cancel an upcoming all-expense-paid trip to Israel, funded by political advocacy groups. Over a dozen members of the City Council have accepted the trip, which begin February 15th, according to the International Middle East Media Center. The City Council members who have been identified as accepting the "hasbara" (PR) trips to Israel are Council Speaker Melissa Mark-Viverito, Mark Treyger, Brad Lander, Antonio Reynoso, David Greenfield, Rafael Espinal, Darlene Mealy, Mark Levine, Helen Rosenthal, Corey Johnson, Ritchie Torres, Andrew Cohen, Donovan Richards, Eric Ulrich, and James Van Bramer. Sadly, this is the 11th fatal plunge from the bridge since 2011. The woman drove her car to the lower level and jumped at 6:14 a.m., according to officials. Harbor units pulled her from the waters by 7 a.m.
UPDATE: The woman has been identified as Laura Fasano of Staten Island, SI Live reports. She was an employee of about 13 years at Regional Radiology in Staten Island. "She will be very much missed, the patients and the staff loved her," a business managersaid. 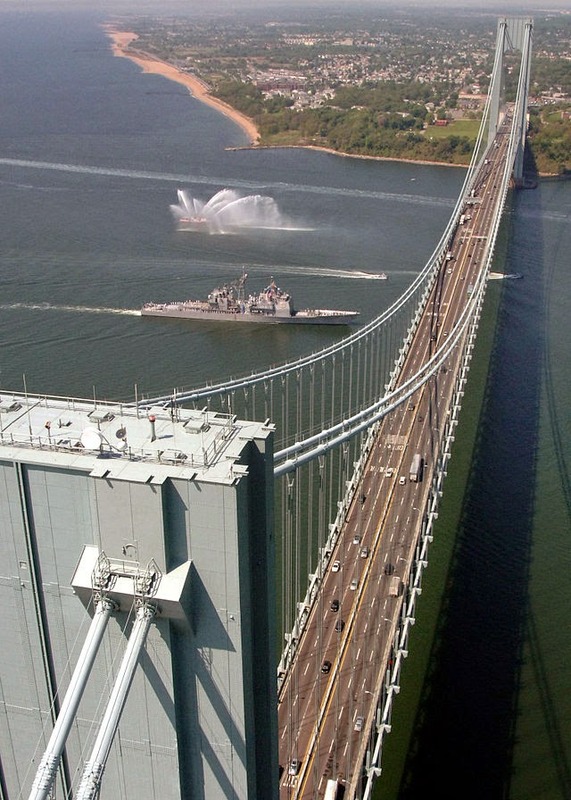 37-year-old woman's fatal leap from Verrazano-Narrows Bridge marks 11th suicide from span since 2011 [SI Live] Updated here.